One last wedding card for the special couple getting married this spring. Since I am making no less than 3 cards for them (one from me, one from a friend who commissioned me to make her's, and one from our church) I wanted them all to be distinctively different. This last one is going to be from our church -- I'll have everyone write a little note of congratulations in it and we'll give it to them along with some $$, a Cleaning Supplies Basket, and a Baking Basket. BIG HUG for sharing the code. 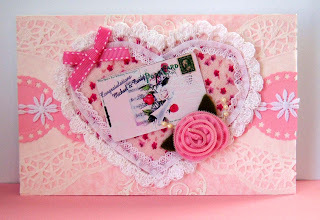 I'm raining hearts right in time for the Valentines blog hop starting tomorrow. hug hug HUG! love the zipper flower, cute! I also love the all white wedding card from the previous post! I'm loving all the ideas for wedding cards. Gorgeous card. I love the softness all of your crochet adds to it. What a lucky couple to get cards like this! Oh this is darling! I love the pink and hearts. What a treasure that could be framed too.